I had the pleasure of being invited to the Millennium Centre to see The National Theatre Performance of Macbeth on Tuesday 19th March. Directed by Rufus Norris, with the main parts Macbeth and Lady Macbeth played by Rory McKinnear and Anne-Marie Duff – it definitely wasn’t for the faint hearted. Depicted as a chilling, cautionary tale about how power corrupts all – this production was unlike any interpretation I had seen before. As it is such a well-known play, the excitement and anticipation was tangible whilst looking round at other members of the audience as everyone eagerly waited for the curtain to rise. 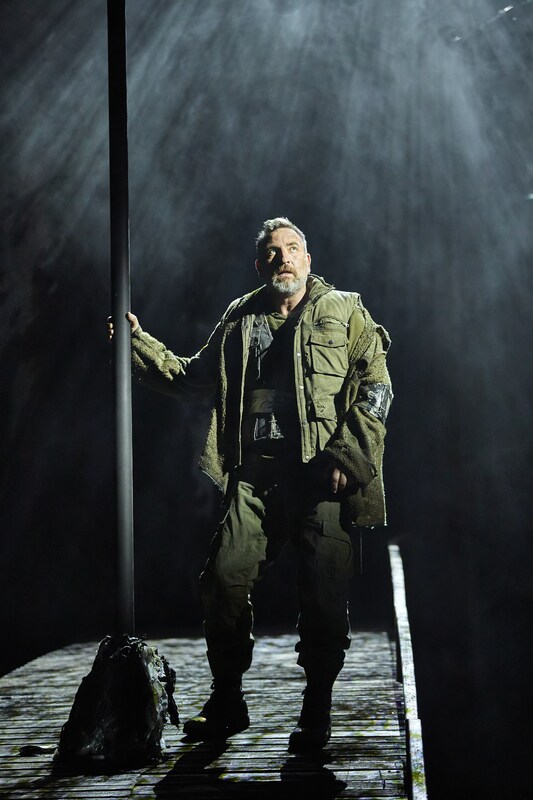 The centre stage was illuminated by spotlight, highlighting the main set piece of an angled deck of a boat with a mast in the middle – ominously setting the scene of the post-apocalyptic time period depicted for the Shakespeare play with a twist. One of Shakespeare’s most popular plays, Macbeth tells the story of a damning prophecy made by three witches that leaves Macbeth and his wife consumed by greed and want for power. By letting himself be consumed by this power, Macbeth seals the fate of his own downfall and those around him. Whilst the setting and time period didn’t effect the plot as much as one would presume, the fight for power and the sense of paranoia was really enhanced by the heightened hostile environment on stage. Micheal Nardone and James Robison, the chemistry between their characters made the portrayal even more heart wrenching and haunting to the audience. James’ wide eyed death stare and blinding march toward the front of stage at the end of the first act was a stand-out moment – the yellow lighting adding to the disturbing effect. The poignant moments of the play were for me, slightly detracted by the exaggerated crying, yet, the acting from all the cast was exceptional. The three witches’ climbing skills were impressive and the sadistic nature of Lady Macbeth, spurred on by her drive to live a better life was immense. Macbeth is out in cinemas on Thursday 10th May, broadcast by National Theatre Live. If you didn’t manage to catch it at the Millennium Centre it is a must see for all Shakespeare and theatre lovers.